There is a listing on the National Historic Register of an archeological site near Table Rock but the location is identified as "restricted." Based on what little is knowable, it is probably in the general area of what we now know as Goat Hill. The Table Rock Site, located near the town of Table Rock, is one of only a few documented late prehistoric earthlodge villages in the Nemaha basin. Artifacts recovered at the site reflect influences from Central Plains Tradition (A.D.900-1450) culture. Sharla Sitzman owns this book and reports that it includes some really interesting information about how homes were built. "Thirteen sites are described in the central and eastern parts of the state, and seven rock shelters and one “ancient” site in the western part. The book stands as an excellent first volume on the results of the field work of the University of Nebraska’s anthropological staff." Five of the sites described in the six chapters are "one focus" and the Table Rock site probably stands separately. The summary concludes, "These papers were issued primarily to place at the disposal of anthropologists an analysis of the characteristics of the various sites. Cultural comparisons on a broad scale were withheld until the various regional groups have been analyzed and digested to a more satisfactory degree. At the same time, the authors have not hesitated to point out cultural similarities where the evidence warrants, nor to indicate problems for the future. The book is of value to archaeologists for the material available for comparative study, and as a method for the presentation of cultural data. Anthropologists will recognize in the growing body of Nebraskan publications interesting information on cultural change and shifts of emphasis from the historic to the completely prehistoric sites. While these studies are excellently done, a number of them, because of uncontrollable circumstances, were not written by the individuals who did the field work. This is to be regretted in any publication. Certainly by this time, the main outlines of Nebraska archaeology have been ascertained, and it seems necessary to shift the emphasis from the sampling of many sites in various parts of the state to the more complete excavation of key sites whose artifacts will elucidate definitely defined cultural and historical problems." The entry after the Table Rock Archeological Site is the Farwell Archeological DISTRICT. I do not know whether any land related to Table Rock is in this District. This district comprises several sites dating from approximately 2500 B.C. to 1400 A.D. The three earliest sites contain much information regarding human adaptation during the Middle and Late Archaic and early Plains Woodland periods. With the inclusion of two additional sites in the district, the Farwell Archeological District has the potential to contain comparative data on the settlement patterns and economic patterns over a period of four millennia in a major river valley in southeastern Nebraska. Discrete concentrations of sites of this temporal range are rare to nonexistent in Nebraska. In 1933, Elsie Pepoon Sutton interviewed people about their memories of the original Table rock. In the course of her interviews, she also gathered local history about other matters. The events she described basically led up to the 1869 fall of the Table Rock. The memories she gathered included the following about Indians in the area. John R. Allen, born in 1846, was 87 in 1933. He came to Long Branch in 1865 but moved to the Howe farm in the Bunker Hill neighborhood in the fall of 1866. Indians traveling to the area of the rocks. One day Allen and his brother saw some Indians and followed them, he on a mule and his brother on a horse. They followed them to a place near the rocks (of what is now referred to as Goat Hill). They found pictures on the rocks and also "on the sandstone above the dam. A great many rocks were thrown into the mill dam, to make the dam" and he suspected they had pictures on them too. Indian Trails. "The old Indian trail crossed the Nemaha on John Wood's place at the ford there. (Eddie Howe says it was called "The Indian Ford.") It then crossed Pete Miller's farm. There was another ford further down (the Morton ford). The trail went to Nebraska City. It crossed Turkey Creek on John Osborne's place and up into the divide on Wider's place." Gabriel Morton, born in 1850, age 83 in 1933. A hundred Indians wintering near the rocks. "One winter father sent me to the ill with a sack of corn to be ground. We had had a storm and the snow had made deep drifts. There were a lot of Indians camped down there in the timber by the rocks -- a hundred or more. I wondered what their ponies got to eat. The Indians had cut down some cottonwood trees and the ponies nipped off the small branches and peeled the bark off the cut trees. Ate the buds from the ends of the branches of standing trees and would paw the snow away to find dead grass underneath. The Indians stayed there a long time. Don't know what Indians they ere. Never heard anyone say. They were just Indians." The 1939 memoir of Elsie Pepoon Sutton are styled broadly as memories of Bunker Hill ("North Table Rock"). 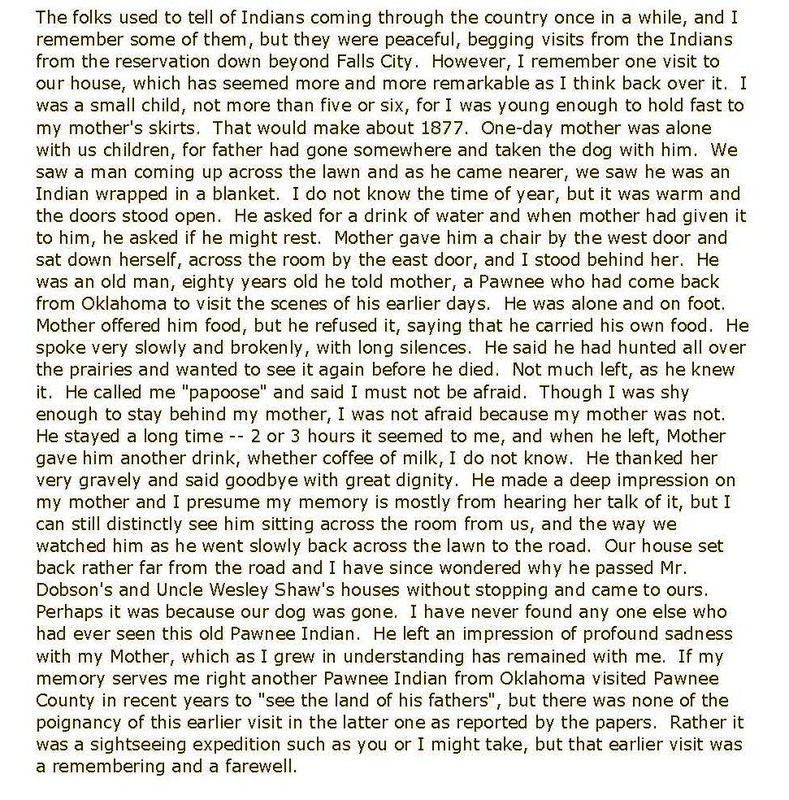 Her memoirs close with a poignant memory of an old Pawnee Indiana who stopped by her home when she was a child.